Mercury Retrograde in Aries — What Will It Mean to You? Mercury Retrograde in Aries — What Does It Mean For You? Mercury entered its storm on Friday, 25 March 2011. Mercury retrogrades in Aries on Wednesday, 30 March 2011. Mercury turns direct in Aries on Saturday, 23 April 2011. Mercury leaves its storm on Monday, 2 May 2011. Given the normal snafu’s of a Mercury retrograde, where else in your life might you see the Mercury in Aries tango? Let’s look at a brief list of what the astrological sign Aries rules. This is the area where Mercury is doing the backward cha-cha. Over the current retrogradation period, you may see some opportunities for review in the Aries-related list below. Your abilities (if you feel sluggish, don’t be surprised). In your own natal chart — the house that Aries rules. Your Aries Sun Sign (Moon Sign, Rising Sign) Friends or Family Members. Typically, a Mercury retrograde is a time to review, re-tool, and make plans to revamp. Here, Mercury is lighting up these topics and giving you a chance to do some evaluation and provides ideas for directional change if you don’t like what you are seeing. Typically, choices and real movement are to be done after Mercury leaves it storm (which would be the 2nd of May) — then, you can throw your throttle into full speed ahead. During Mercury retrograde, drag out those musty projects and give them another go. Basic rule: Don’t do anything new (that could cost you big time later). Okay, and that’s just the short list. Now do you know why just about everything seems to go crazy during a Mercury retrograde? The Rulership Book by Rex E. Bills, published by the American Federation of Astrologers. The Book of Rulerships — Keywords from Classical Astrology, by Dr. J. Lee Lehman, Ph.D., published by the Whitford Press. So! If boredom strikes you this Mercury retrograde, you can always do a history search — what was this period in 1932 really all about? A glance through newspaperarchive.com shows that new clues surfaced on the missing Lindbergh baby, former President Calvin Coolidge paid off a law suit, politicians vied for more taxes on a variety of subjects from cars to sewage handling, Stalin’s wife cut her classes at school (no kidding), banks were forced to pay customers restitution, New Foundland’s leader was attacked by rioters, Marconi linked the radio with the telephone with a new invention, Clarence Darrow hit the front pages with a murder trial in Hawaii, Von Hindenberg defeated Hitler for the High Office, Senators opened stock market probe, and more. Thanks for reading! Your comments welcome! Spring Equinox! Truly a powerful holiday, especially for starting new projects particularly those involving the home. Kick start this quarter energy with the amazing full moon energy available this weekend, and you can make a truly magickal house blessing jar! This article has instructions for two types of magickal jars — the more ornate Herbal Jar or the super easy Spring Equinox Jelly Bean Jar. The House Blessing Jar is both a protective and blessing vehicle tuned to the type of herbs you select for inclusion. Generally, the herbal jar will last approximately one year if re-empowered either by sunlight or moonlight every three months, particularly on High Holy Days or days of heightened astrological significance. 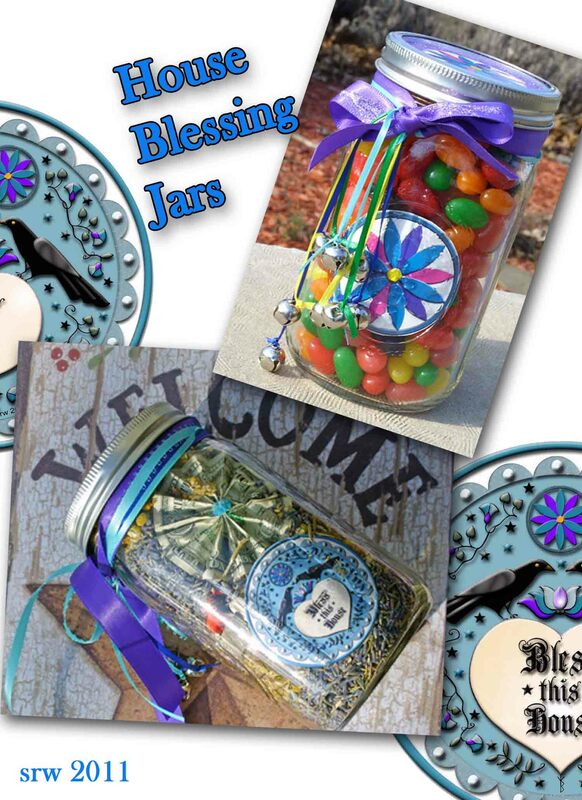 The contents of the Jelly Bean Blessing Jar is meant to be consumed within a three month period, and is a perfect fast and easy gift for a family member or circle mate. Your intent and focus while constructing either jar makes all the difference in how well the jar will work. To read the complete article on How To Make Your Own Equinox House Blessing Jars, just visit http://www.silverravenwolf.com/RavenWolf_Projects.html — its free! Article contains complete instructions including photos, a house blessing, herbal choices and upcoming astrological events to enhance your work. Whether you choose the more ornate Herbal House Blessing Jar or the Super Easy Jelly Bean Blessing Jar, you’ll love the easy steps to complete either project!